The first location of interest to the Decimal Lab while visiting Tokyo was the Canadian Embassy. Before venturing to Japan, Dr. Isabel Pedersen had made contact with Counsellor and Senior Trade Commissioner at the Canadian Embassy in Japan in order to set up a meeting while we were in the country. He was kind enough to accommodate us at the Embassy on September 4th where we met with him and another Trade Commissioner. The Decimal Lab had the unique opportunity to talk with Embassy Trade Commissioners about the commercialization possibilities for two of our current projects, the marketability of our research, the institutions that could be interested in collaboration at an international level, and the industries that would be interested in working with us should the projects expand past their “proof of concept” phase. This meeting was extremely beneficial to the Decimal Lab team in order to expand governmental, institutional, and industry connections at an international level. 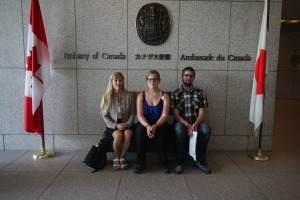 Forging this connection with the Trade Commissioners at the Canadian Embassy, especially in a country so technologically situated as Japan, was very important to the Decimal Lab team. The Decimal Lab team planned to visit Miraikan: National Museum of Emerging Science and Innovation. 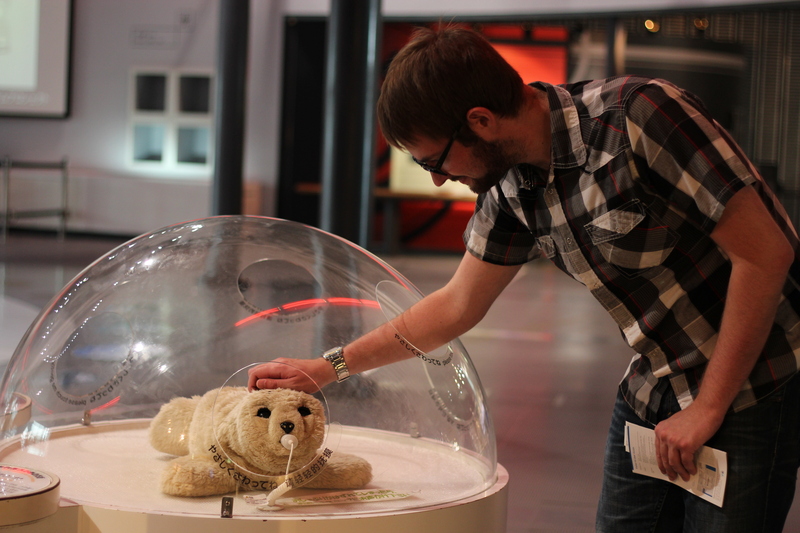 Getting to this museum proved to be more of a challenge then we had originally anticipated. It took two subway trains and a monorail, but we made it to the island at the coast where Miraikan is housed. Right next door to it we were pleased to find the National Institute for Advanced Industrial Science and Technology. Japan as a nation is constantly striving for innovation and forward thinking; however, they do not forget their cultural or historical roots and are constantly reflecting on what has been done and where they come from. So it was not surprising to find an institute of higher learning focused on science and technology next to a museum documenting the milestones that Japan has made in this area. Miraikan is a seven-floor museum with conference rooms; a dome theatre and a virtual reality theatre; and several research areas. Within this building we saw many of Japan’s greatest technological advancements: from breakthroughs in medicine to space travel to androids and robots. Several cutting-edge exhibits contributed to the museum’s emphasis on innovation. The most popular being Geo-Cosmos, the symbol exhibit of Miraikan, which produces a rendition of the Earth shining brightly in space with a super high precision exceeding 10 million pixels. It is the world’s first “Globe-like display” using organic LED panels. This visit allowed the Decimal Lab team to gather important field research for the Fabric of Digital Life Archive as well as experience unique technologies that are currently not available in Canada.